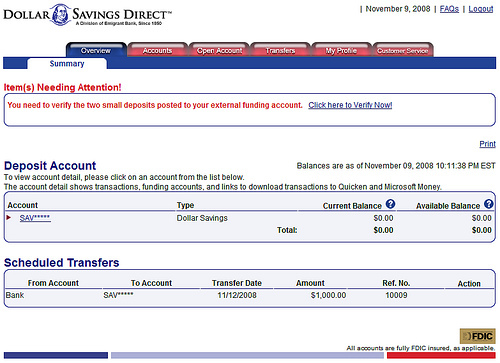 Dollar Savings Direct is a division of Emigrant Bank, which also owns Emigrant Direct. The account currently has a 3.05% yield with a $1,000 minimum deposit requirement. I have been mulling the idea of getting another savings account with a better return for several months because I am not very happy with the rates from banks I am currently using (Capital One is quite steady, but not FNBO Direct and IGoBanking). Since this round of rate reduction campaign started last summer, interest rates from popular online banks have been steadily declining. After the Fed’s latest rate cut, ING Direct even dropped its rate to 1.85%, the lowest among the banks I track regularly. While most banks followed the Fed’s action to lower their rates, this is not what’s happening everywhere. There are a few banks buck the trend to raise their rates, such as DollarSavingsDirect and GMAC Bank as I mentioned early. Why? As there’s no sign of improvement in the credit market, banks would love to keep their customers, and their cash, by offering an attractive rates. For the new account, I have mentioned a few times before that there are a few candidates on my mind, including EverBank and DollarSavingDirect. The reason I was waiting for the right time is that I want to see which bank can maintain its rate after the Federal Reserve cut the fed fund rate to 1.00% late last month. EverBank was removed from the list when the bank reduced its rate last week, leaving DollarSavingsDirect, with a 3.05% yield as of now, as the only choice. Even though UFB Direct also offers the same return, I am more comfortable with DollarSavingsDirect because I have dealt with another bank, Emigrant Direct, from the same parent company before. Enter personal information: Personal information and driver’s license are needed when opening an account. Fund account: Link my existing checking account (bank’s routing number and account number are needed) to DollarSavingsDirect to fund the new account electronically. Because the bank requires a minimum of $1,000 balance to earn the 4.00% APY, it asked to make at least $1,000 deposit when the account is opened. The checking account linked to DollarSavingsDirect during the application process will be the external bank I will do all transactions later. Before the linked bank becomes active, DollarSavingsDirect will use two small trial deposits to verify the ownership of the external account. I expect to see those deposits to show up tomorrow in my Bank of America account, so hopefully the application can be completed by then. Since DollarSavingsDirect uses ACH to transfer funds to and from an external account, it takes a few days before the fund becomes available. According to DollarSavingsDirect, fund transfers via ACH usually takes 2 to 4 business days, but the deposit will be credited to the account and begin accruing interest on the business day of deposit. For each electronic deposit, there’s a five business day hold period before the fund can be withdrawn. After quickly going through their website, I wasn’t able to find out how many external accounts I can link to DollarSavingsDirect. I need to link more than one bank account to it since I want to move money around among my savings accounts with the best rate. It, however, shouldn’t be a problem if DollarSavingsDirect allows only one external link because I can always link to it from other online banks which do allow more than one external links (for example, Capital One allows multiple external links). Dollar Savings Direct routing number is 226070403. Nowadays, one of the most important thing to look at when getting a new bank account is whether the bank is insured by the FDIC. You don’t want to see your hard-earned money disappear by using a non-FDIC insured, regardless how much return it promises. Emigrant Bank, which owns DollarSavingsDirect, has been insured by the FDIC since 1934 (FDIC Certificate: 12054) (use the Find Bank function at FDIC and enter the bank’s name). With DollarSavingsDirect, deposits are insured up to $250,000 as currently allowed by the law. Bankrate.com has a Safe & Sound Rating of DollarSavingsDirect’s parent Emigrant Bank at 2 stars. Not very impressive (more discussions on Safe & Sound Rating). After the account is set up, I logged into my account and above is how it looks like. Before accessing my account, I had to provide answers to five security questions. Since I had the experience in the past that I had to call the bank to reset my password because I forgot my account password and couldn’t remember all the answers to the security questions either. To avoid that, I use KeePass together with TrueCrypt (both are free) to manage all my account passwords. Interested? Open a Dollar Savings Direct Online Savings Account and start to enjoy the super high return for your money now. opened up a DSD acct a couple weeks ago. FYI, mint.com has problems supporting DSD. David, you’ve just been unlucky to time it wrong. I opened my DSD account sometime in late summer/early fall when the rate was 3.75%. Then, while other banks were lowering rates, DSD increased theirs to 4% and kept it there for several more months (until the end of 2008, I believe). Looking back, I also had money with Emigrant, had their 1.4% cash back credit card, and took advantage of them until I could do better elsewhere. Like the saying goes, “all good things must come to an end”. Most of my liquid money is currently with DSD, and as soon as I find a good enough deal, I’ll be playing the “yield chaser” game again. Dollar Savings Direct is not a good bank. I opened my account with them while they promoted an interest of 4%. Within one month they lowered their rates three times to 2.05%, which is lower than many other online savings accounts. That gives the impression that they behave like fishermen. Once the fish is on hook they don’t care about you. Their service is nothing I can recommend to my friends either. David and Irene… since you seem to hate DSD so much because they lowered the rate, can you please tell me who has a better rate. IMO, they still have one of the highest rates around and there system is very very easy to use.